The plate mill of Mannesmannröhren-Werke at Mülheim an der Ruhr is one of the most performant plate mills in Europe, its production capacity allows a maximum of one million tons of rolled plates per year. These plates are then processed into longitudinally welded large pipes used for transporting liquids or gases. In general, continues cast slabs are rolled into heavy plates by thermo-mechanical rolling - with additional accelerated cooling if needed. The dimensional range includes plate thicknesses from 6 to 45 mm and plate widths up to 5 m Maximum rolling length is 28 m. This covers steel grades up to API grade X100 for onshore and offshore use. For such plates, very high requirements in relation to mechanical characteristics, cleanness and absence of defects are imposed on the steel. Accordingly, non-destructive testing by means of ultrasound plays a major role. The aim of NDT is not only to detect any possible defect non tolerated according to customer specification, NDT is also the means for feedback to the steel mill. This approach ensures constant improvement of pre material quality. Tight interaction between the companies involved as well as continuous recording of all pertinent data during the manufacturing process guarantee a consistently high quality level of products. One testing cycle covers 100 % of the plate surface for plates up to a width of 5000 mm. The double crystal technique is employed. Testing sensitivity makes sure that a 3 mm flat-bottom hole is detected in plates between 6 mm and 50 mm in any depth. Plate body testing is installed at the end of the production line. The aim is to optimise the performance of the finishing line. Plate edge testing is performed separately on the plate before trimming because this is the only way to cover 100 % of the longitudinal plate edge without any restriction (compare figure 1). A separate evaluation PC collects the testing results of both devices. Based on the customer specifications for plate body and plate edges, it decides whether an indication still complies with the specifications as far as its size and its position are concerned. A data link ensures communication with the central computer which supplies parameters, management of test results and forward of plates. In order to realise the requirements in terms of testing sensitivity and leaving additional room for future increases, a new probe was designed based on the proven plate edge testing probe. That probe is used both in the plate body testing equipment and the plate edge testing device. Modular structure of mechanical and electronic components. In case of malfunction, any assembly can be replaced quickly. Furthermore, a standby computer system is provided which can be take over whenever needed. In co-operation with the Mannesmann Forschungsinstitut (R&D Institute), the concept of a new probe was developed. It was based on the TR multiple transducer which had proven its reliability for years in the plate edge testing equipment; the latter comprises a transmission transducer of about 55 mm in width and a three-fold partitioned reception transducer so that a transversal resolution of about 17 mm is provided. Maintaining the size of the probe, the reception transducer has been partitioned into 4, which allows a better transversal resolution of 12.5 mm (see figure 2). Since the transducer is made of composite material, a further plus in amplitude is possible. Nominal frequency increased from 4 to 5 MHz contributes to a finer resolution. The new developed probe holder is suspended by cardanic joints, and its length of stroke of ± 100 mm with regard to zero level makes sure that it can follow any plate irregularity so that optimum coupling is always guaranteed. In order to ensure a 100 % coverage of a maximum plate width of 5000 mm, 99 probes for plate body testing and 2 probes for plate edge testing are required. This results in 396 testing channels for plate body testing and 8 testing channels for plate edge testing. The probes can not be directly arranged one beside the other. On the one hand, the transducers have to be mounted into the housing, therefore the housing is larger, on the other hand, guiding elements are required at the left and the right side of the probe to guide the probe, provided with cardanic suspension, along the plate. This is the reason why two testing frames with 50 and 49 probes respectively are used for plate body testing (see figure 3). The second frame is displaced by 50 mm in width compared to the first, which makes sure that gaps due to the testing mechanics can be filled. Displacement in longitudinal sense is compensated by the equipment's computer when treating the testing results. Figure 4 gives an overview of the plate body testing equipment. You can see the skids for plate in-feed, the control station and the two testing carriages, which can be taken out of the conveyor for maintenance purposes. An extensive local electronic system provides for pre-amplification and multiplexing of the signals relating to the 396 reception transducers before the signals are treated further and block-wise by the logarithmic main amplifier systems (see figure 5). The mechanics and the electronic system were designed and built by Nukem - Nutronik. At first, plate edge testing with its comparably low number of channels was commissioned in April 1999. During that phase, first experiences under real conditions could be made. After that trial phase, the commissioning period of the plate body testing equipment began in May 1999. Following a short run-in time, the new plate body testing equipment could be commissioned on the 13th of October 1999. After the plate identification number is recorded, the operational data management systems supplies order-specific data as well as plate width, plate length and gate parameters to the process computer of the plate body testing equipment. The plate is automatically fed into the equipment. The probes touch down directly at the transversal plate edge. For each probe, amplification is adjusted to the bottom echo in question, and then testing is started. Testing speed is 0.5 m/s. The same operation is carried out for the second testing carriage. The whole test cycle, from the start to the end of testing, is controlled and monitored, through a chain of sensors, by means of a PLC. After a short run-in phase, availability has been constantly above 98 %. Maintenance and servicing are performed by appropriately trained personnel. Skills required for these tasks were acquired early, during the mounting and commissioning phase. Furthermore, the equipment is provided with an automatic check of the amplifier systems for linearity and frequency response as well as many test routines; in part, those routines are carried automatically as a means of self-monitoring, in part, operators can use them specifically for rapid identification of failure origins in case of problems. 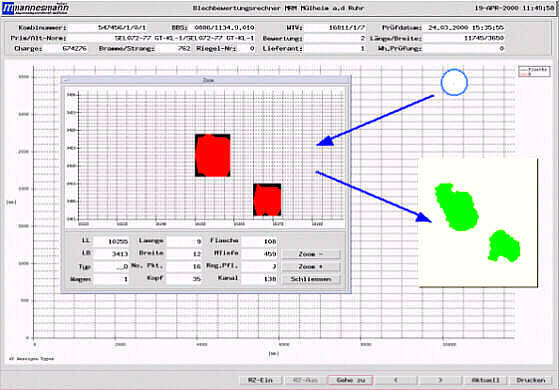 A zooming feature allows for qualitative evaluation of small indications. An example of a defect detected by the plate body testing equipment is shown in figure 6. In normal mode, it can be hardly seen that there are two neighbouring indications (see circle). After zooming, however, contours of the indications can be clearly presented. When scanning the separated area on an automatic lab testing device by means of a high-resolution point focus probe and a tight testing grid, the C-scan, which is also shown in figure 2, can be visualised. Both defects were tolerated according to the specification in question. For all indications, even those which do not exceed specification limits, characteristics as for instance type, position in the plate, size and position in depth as well as all testing parameters are recorded. They are filed for at least 10 years in the plate evaluation system. Based on those data, the testing result of any plate can always be reconstructed, should there be any question later. It is also possible, in retrospect, to present the results of entire casting sequences or of a complete order as far as the degree of cleanness is concerned. Since one of the objective has been to significantly reduce the amount of retesting when investing into the new equipment, we perform intensive comparisons between indication dimensions provided by the automatic systems and those of manual ultrasonic testing. Furthermore, indications detected by the automatic systems are examined and compared by the NDT department of the Mannesmann Forschungsinstitut by means of an ultrasonic system for cleanness analyses. Optimisation of the testing equipment in view of determining the real dimensions of even small defects will provide the opportunity for leaving the decision whether to eliminate critical indications by cutting or discarding a plate largely to the evaluation system. 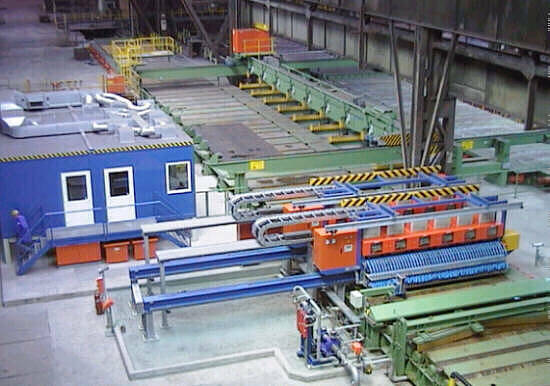 Considering the further development in the field of materials as well as the adaptation of specifications to this trend and possible shifts of focus within our product range, the flexibility and the testing sensitivity of the system make sure that the plate mill of the Mannesmannröhren Mülheim will be able to keep on guaranteeing ultrasonic testing for quality assurance purposes.